If you thought my last blog entry on the application of Israeli sovereignty over Judea and Samaria was depressing, brace yourself for impact. 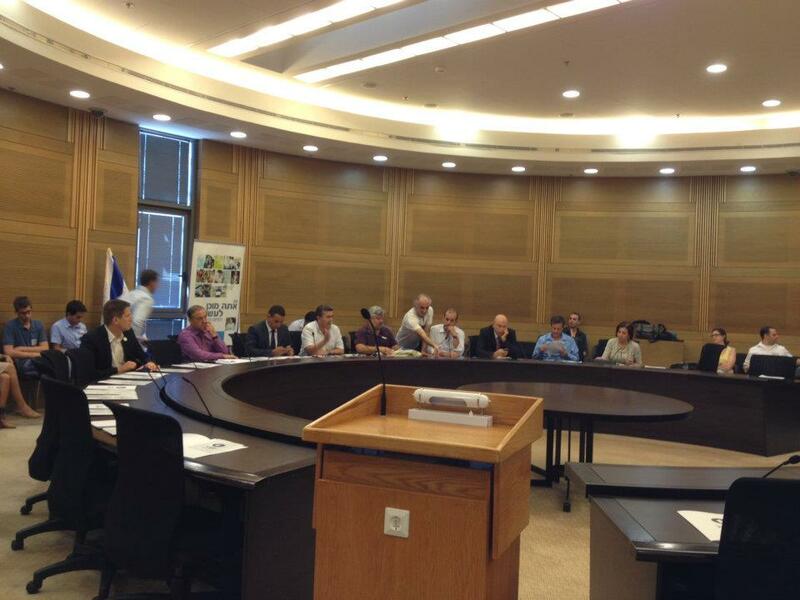 The lobby for a two-state solution held a public meeting in the Israeli parliament about a week ago, featuring MP’s from the Labor party, Kadima, Meretz and Hadash. I went there for the sole purpose of figuring out whether the people running the show thought peace was just around the corner or well behind the horizon. Those people were Dr. Gershon Baskin (founder of IPCRI), attorney Gilead Sher (Blue White Future), and Ted Harris (One Voice). Gilead Sher: Israel must perform “constructive unilateral moves”, separating itself from the Palestinians in order to maintain a Jewish majority within, whether there is an agreement signed or not. For example, Israel should prepare to absorb those hundreds of thousands of Jews living beyond the Green Line, resettling them along the coastal area of Israel, at an estimated expense of 50 billion Shekels. Even this, Sher admits, will not guarantee we’ll find peace, but argues it must be done regardless of anything. Isaac Herzog (Labor): We should show the Israeli public that we have a partner on the Palestinian side before the public can agree to disengage and evacuate more settlements. There is not enough trust between our respective leaders. Avishay Braverman (Labor): We must realize maintaining the status quo puts us at risk. It’s similar to the mood in Israel after the 1967 war, when people thought we had everything sorted. We are heading towards a catastrophe. Zahava Gal-On (Meretz Party): It’s good to see there are people pushing in the right direction while our government involves itself in survival maneuvers. Peace is our highest priority when it comes to promoting social justice in Israel, since after the security issue is off the table, we’ll be more free to invest in our own society. As you can see, the MP’s present at the meeting were uninspiring, had nothing new to tell us, and basically killed any enthusiasm that might have been lingering in the room. They expressed no hope in reaching a solution with Palestinians, blaming the current Israeli leadership upfront, but also recognizing the lack of will on the Palestinian side too. Ted Harris (One-Voice): All those who have led negotiations recognize there is a Palestinian partner. Those who did not gain experience in negotiations spread the rumor that there isn’t one. With the Palestinians running deep in debts and suffering the from the global economic crisis, it is not unlikely that we will see a rise of radical movements and a violent outbreak in the near future. Dr. Gershon Baskin: According to recent poles made in the Palestinian territories, we see Fatah is slightly more popular than Hamas. The most prominent Palestinian leader today is Marwan Barghouti, who is serving five life sentences for direct involvement in terror attacks on Israeli soldiers and civilians. Among the Palestinian population, there is very little hope and almost no expectation to see peace any time soon. The impression I was left with was that the “peace camp” in Israel is rather tired and without hope. While it is easy to blame Netanyahu’s right-wing government, at least some of them remembered to mention there would probably not be peace under any other government either. As sad as that is to admit, that’s what I went there to hear. I was wondering how optimistic or how cautious the speakers might be, and found most of them to be more-or-less sober about the prospect of peace. In-fact, some of the speakers mentioned that being a “leftist” in Israel is becoming somewhat of an insult, as it appears most of the public feels further concessions to Palestinians will not make them like us any better than they already don’t. On the practical level, I learnt that the current trend in the Israeli left is similar to the current trend in the Israeli right, that being a trend of unilateral decisions. The right-wing conference I attended called for annexing the West-Bank. This lobby meeting called for a unilateral withdrawal. Both camps claim to work for the best interest of the Jewish-Israeli sector, insisting that the other camp is leading us towards a catastrophe. Both camps also insist their approach will benefit the Palestinians, as if there were not enough contradictions between them already. Well, at least they all mean well. What we might need now, if we want to see an Israeli withdrawal or a renewal of negotiations, is something along the lines of what the Arab Peace Initiative fails to deliver. It is a signal, an indication, from the Palestinians and for the Israelis, saying that the Jewish character of Israel is not at threat. By doing so, they would revive the Israeli peace camp, they will bring an Israeli withdrawal to the separation barrier closer, they will take another step towards independence. The speakers at the lobby meeting referred to this question, the Jewish character of Israel, saying it should not be a precondition for negotiations, in-fact it should be left out of the whole debate. This, they said, is entirely an Israeli issue, irrelevant to other nations. Of-course, the speakers agreed, Israel should always remain the national home of the Jewish people, maintaining a clear Jewish majority and holding on to Jewish state symbols. Ironically enough, they said all of this in response to an Israeli peace activist who explained how he finds it impossible to draft a vision statement for his bi-national peace movement. He keeps insisting Israel should always remain Jewish in character and composition, and his Palestinian partners for peace insist it is unacceptable. To my understanding, this is exactly the root cause of the conflict. The Jews aspired for sovereignty over some part of the land, and they got it in 1948. The Arab Peace Initiative shows us this is still unacceptable in the Arab world today. Israelis will not support a peace agreement which will cause them to forfeit their hard-earned independence, they will only support a peace agreement which serves their interests. The Palestinians appear not to be ready to come to terms with the existence of a Jewish state, and I wouldn’t expect unilateral moves or any sort of technical maneuvering to resolve this ideological gap between us.